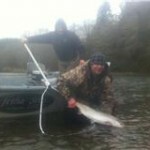 Coast Guard licensed and approved. 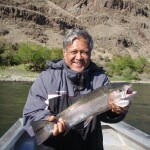 I’m Baaaaaaaacck…., I just arrived back home on 11/1/11 from my month long guiding adventure at Heller Bar, WA on The Snake River. 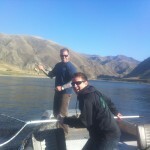 I was able to guide 27 of those 30 days with some great people on my boat. 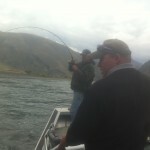 The scenery was epic and the weather except for 3 rainy days was fabulous. 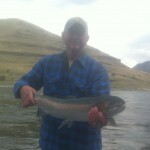 Summer Run Steelhead were the fish of choice…, but we caught many Chinook adults and jacks, plus catfish, squaw fish, white fish, sturgeon, bass, and suckers all side-drifting good eggs. 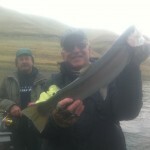 The Snake is a very healthy river system to say the least. 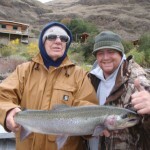 If you missed this fishery in 2011, not too worry…, as I am already working on my 2012 season on The Snake River at Heller Bar, WA. 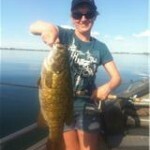 I will start around 9/15/2012 and finish up around 10/10/2012. 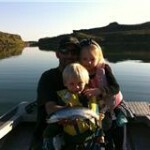 I would recommend 2 days on the water if at all possible. 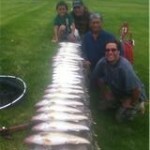 This year was Wall Tent central and I’m looking to rent a house this next year. 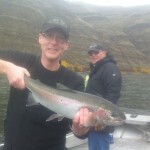 If nothing is available I will run my trips through the Red Lion in Lewiston, ID which is 45 minutes from the boat launch and is surrounded by restaurants and stores for your convience. 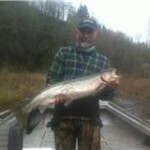 Otherwise your more than welcome to camp out at Heller Bar right at the mouth of the Grande Ronde River with me. 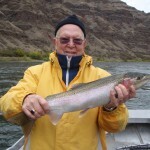 Fish, Big Horn Sheep, Turkeys, Chukar, Deer, fires, glo corkies and spinners from the bank, drinks, and that days fish stories are all a part of The Heller Bar experience. 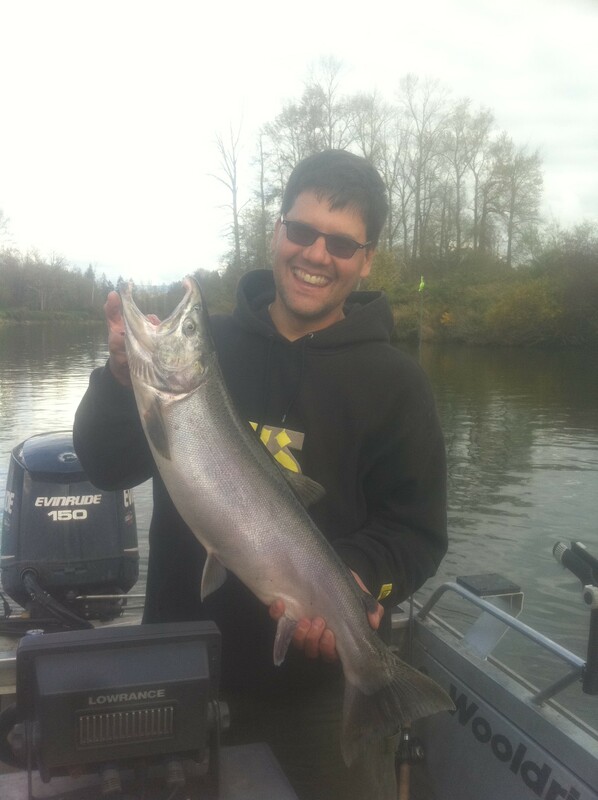 I was looking over my fish log for the month of October and my boat landed over 250 Steelhead, not including King Salmon and Jacks! 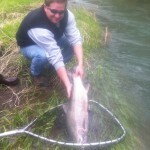 You can expect double digit fish days on this river. 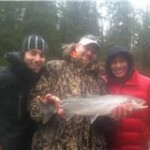 We did have a couple of slower days where we caught 5-8 Steelhead and Kings. 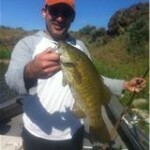 But again only a couple of slow days. 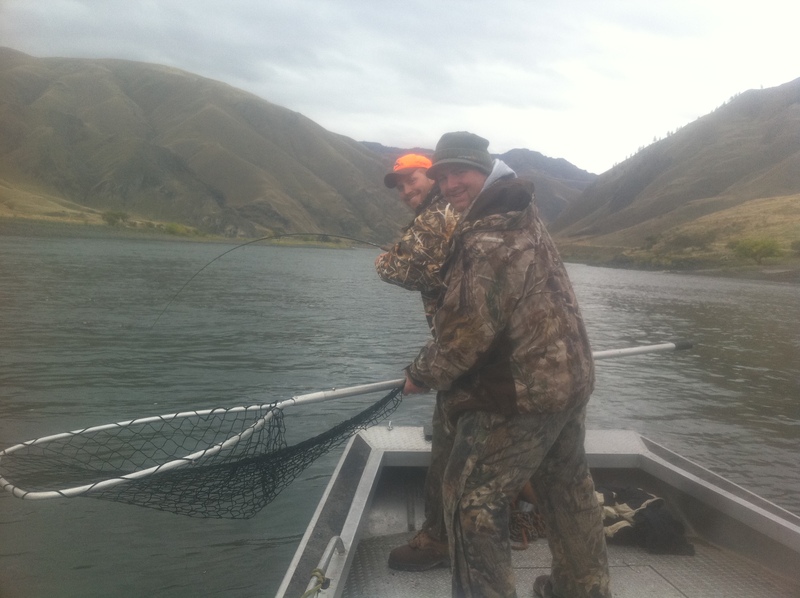 The water was at a 20 year high for that time of year which definitely changed the fish holding locations a bit…, it took me a day to re-figure it out. 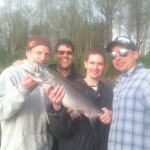 But after that day it was on. 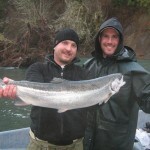 Our best days were 25-30 hook ups on Salmon and Steelhead…, NO joke! 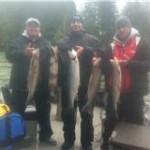 Below are some of the fish that we caught. 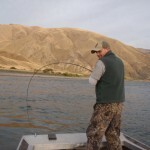 FYI those un-clipped fish (you will see in the pictures below) are legal to pull out of the Water with an Idaho fishing license. 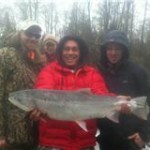 Get a hold of me with any questions regarding my favorite Jet Sled Steelhead fishery, hands down! 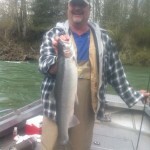 I am now booking winter run steelhead trips on the Cowlitz, Sky and Snoqualmie Rivers starting 11/29/11 through 12/30 /11, Get your date…, before your too late! 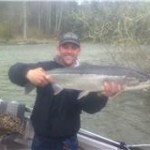 FishON and see you on the water Also, don’t forget to check out Steelhead University’s fishing report as I put up a fresh weekly report there, you can go directly there through the links section on my mywebsite’s home page. 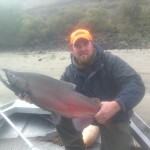 Mention Salmon Steelhead University and take 10% off of your next fully guided trip from now through December!! 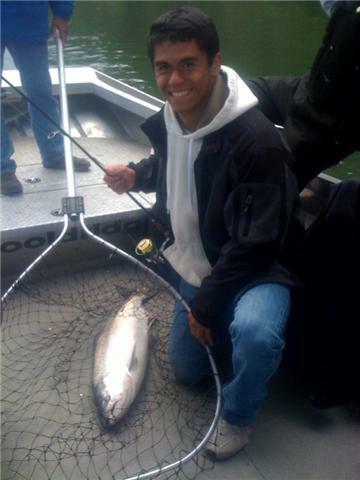 Its almost August and the fishing is GREAT all over WA State. 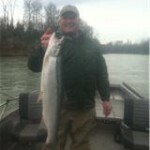 The Ocean is kicking out fish.., The Columbia river from the Mouth all the way to Rufus Woods is giving up chromer fish…, and the Rivers, Lakes and Reservoirs are all hitting for Bass, Walleye, Trout, Steelhead and even panfish…, basically it’s ON like Kong!! 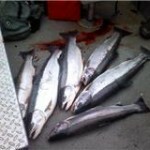 I have been targeting Sockeye and Chinook Salmon, Bass and Walleye the past week and will continue to do so through Mid August. 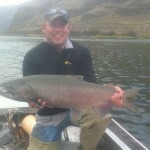 The Brewster Pool and Well’s Dam fisheries are in prime form right now! 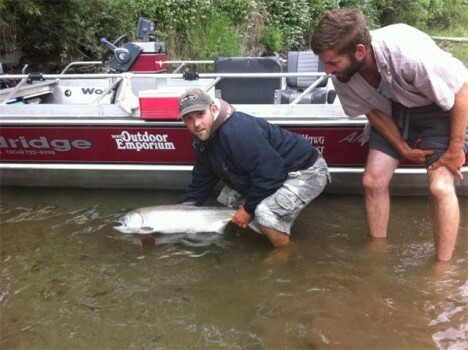 Expect to fill your cooler with bright, red sockeye meat. 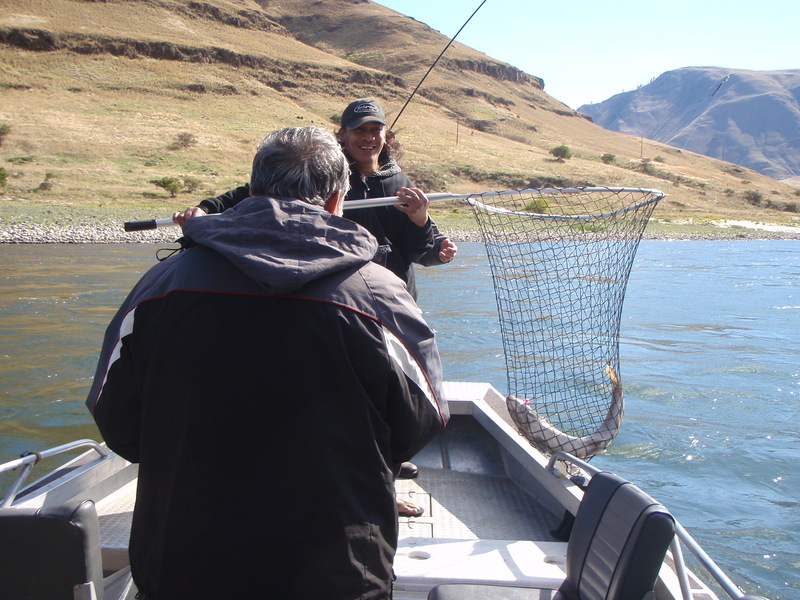 The Limit on this Columbia River fishery is 6 Adult Salmon per person. 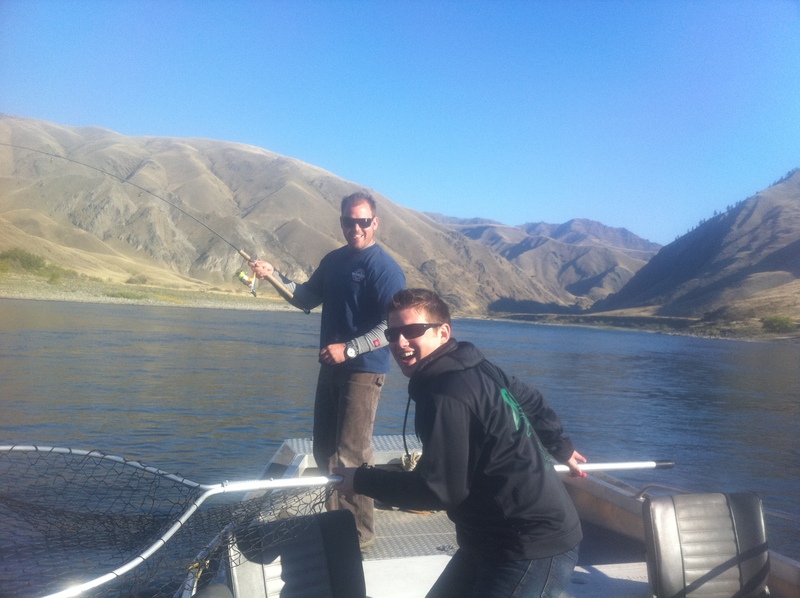 We are trolling on down-riggers, enjoying cold beverages, catching fish, in exceptionally nice Eastern, WA weather Bring your sunscreen and I will put you on the fish. 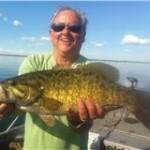 Also…, if anyone wants to get their top-water Big Bass fix…, now is the time. 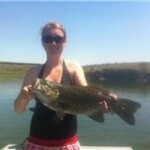 We have been doing VERY well on these massive bass. 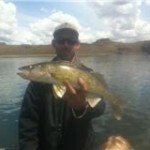 The BIG Walleye are on the feed, as well over on Moses Lake and The Potholes Reservoir. If you would like to get in on the action get a hold of me before August 17th. 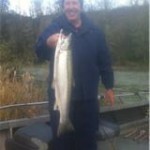 I then shift gears back over to the Snohomish River system for Pink’s and Coho and Lake Sammamish for King Salmon through late September . 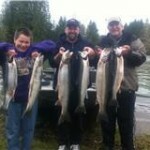 These are “Local” fisheries only 30 minutes, or less from downtown Seattle. 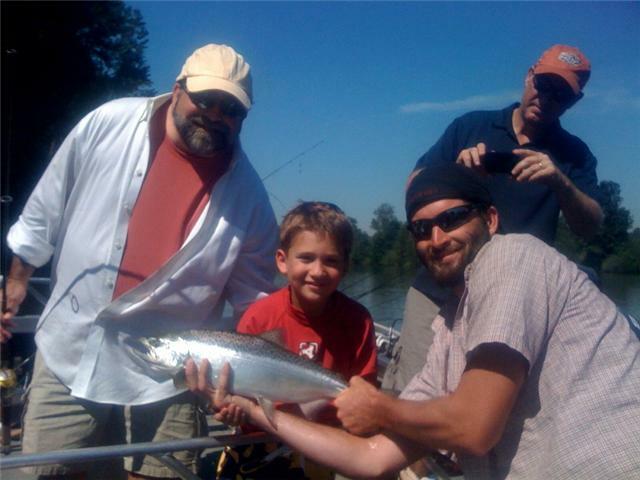 FISH-ON GUARANTEED for any of the Snohomish River, or Lake Sammamish fisheries…, and If you like we can even fish The Lake and River.., both on the same day (they are only 45 minutes apart)! 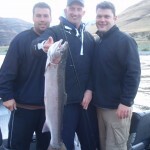 Remember the Pink Salmon run is only every other year and I have only a few prime dates left open…, that is if you and your friends and family would like to come and enjoy the most productive fishery Puget Sound has to offer…, hands down!!!! 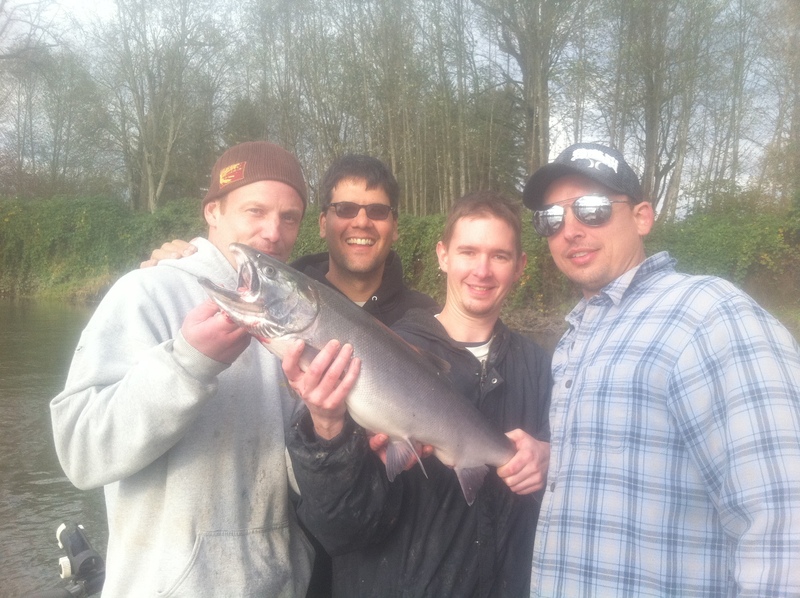 Oh and thanks again to every single one of you whom came out to experience the fantastic fishing we had on the Skykomish River from the opener through this last week. 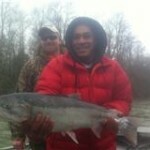 What a great season it was for King Salmon and Steelhead! 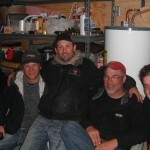 Hope to see you all out there again next year come June 1st! 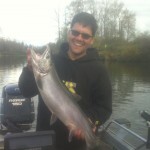 If your looking to CATCH fish call me…, and I look forward to seeing you on the water! 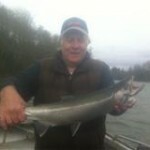 Since the June 1st opener of the Snohomish River System life has been good…, to great for the local fisherman. 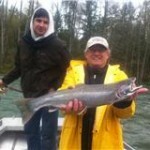 The Sky River has been showing consistent results for Summer-run Steelhead and king Salmon. 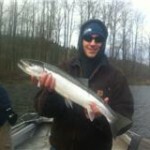 These fish come in almost everyday on the bell curves due to the snow melt and rain. 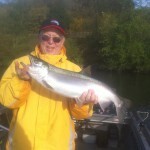 This means chrome-bright, sea liced, scrappy fish that fight like crazy every day!! 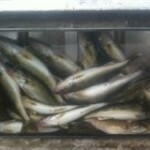 My boat has been doing very well side drifting eggs and shrimp. 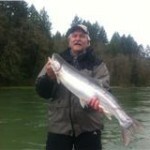 The water is running quite high and heavy, which is typical for June fishing on the Snohomish system. 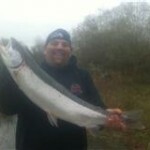 With that stated…, the jet sled has been the top choice vs. my drift boat. 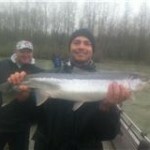 If you want in on the action get a hold of me before your, too late. 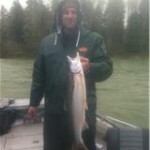 The King salmon retention closes on July 31st. 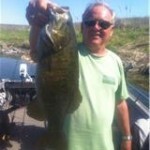 I do have a few prime dates still available. 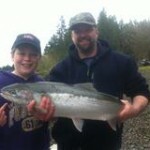 Again…, this fishery is only 30 minutes from Seattle!! 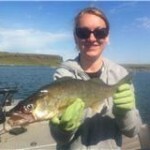 The walleye action continues on a strong note over on The Potholes and Moses lake. 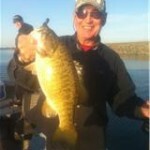 Trolling worm harnesses and crank baits are the top producers. 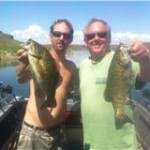 Crab Creek, Lind Coulee, and the mouth of the Frenchmen’s have all been super productive on the reservoir. 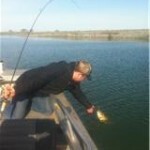 Fish early and late if you are targeting trophy fish. 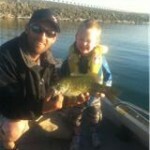 The Large and Smallmouth bass are in full swing. 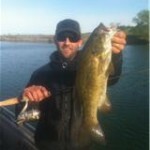 This year has given up some of the biggest bass we have seen in years on the Potholes. 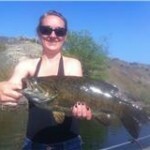 The bass we target will average right around 3lbs…, with the bruiser’s pushing near 10lbs!! 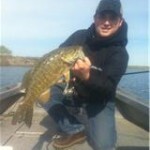 My favorite fishery on The Potholes is chasing these Lunker Largemouth bass…, hands down. 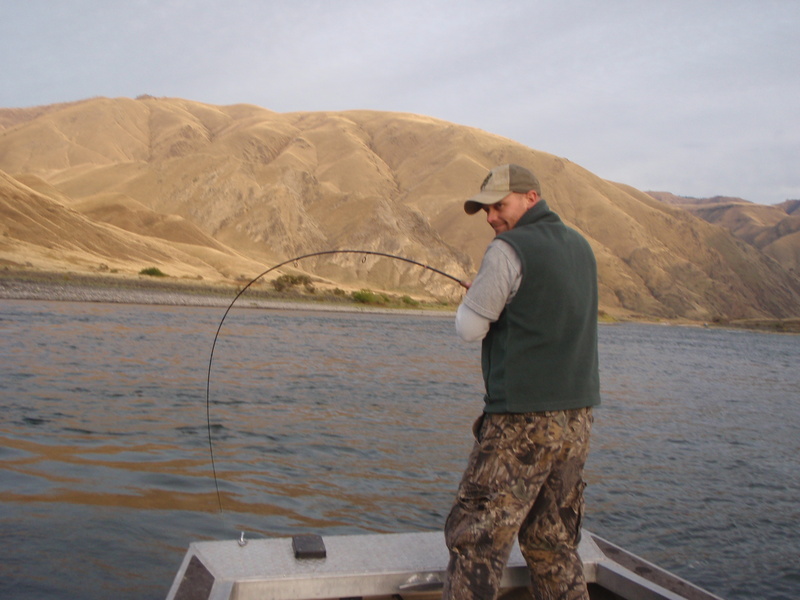 If anyone wants to see a little slice of summertime, WA State, heaven get a hold of me for a Sand Dunes Large-mouth Bass adventure. 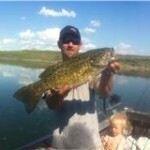 Top water fishing at dawn and dusk…, soft plastics and spinnerbaits in between and your in for some serious BIG bass action from now through September. 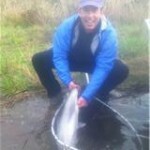 Wow…, another month has flown by since my last report! 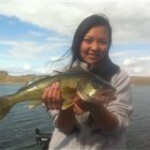 I completely switched gears over to the Potholes reservoir to catch Walleye, Bass, and Trout. 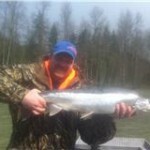 The weather and the fishing has had it’s ups and downs, but that’s why I head east this time of year. 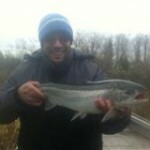 With all the different waterways to fish and different species of fish there is ALWAYS a bite going on somewhere within a 30 minute drive from my place on the Potholes golf course…, no matter what the weather situation is. 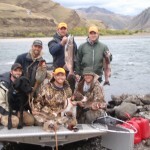 If your interested in getting bit multiple times per day, and simply relaxing while catching a bunch of fish this is your kind of trip. 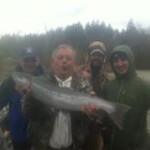 For you rainbow trout enthusiast’s out there…, we have been smoking the trout! 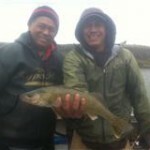 Expect limits every time, if you would like to do some trout fishing. 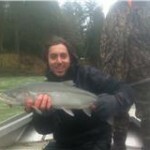 I typically troll for these fish. 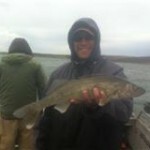 I also fly fish a few “special” lakes at the potholes for trophy trout, as well. If your interested let me know. 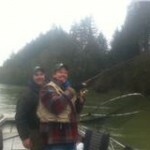 Drift boat fly fishing over on the eastside is very relaxing and productive all at the same time. 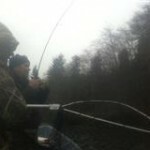 Since I last reported I have been on the Cowlitz doing damage to the Cowlitz river Steelhead population. 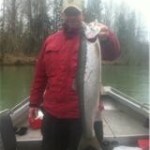 I have been giving a fresh weekly report on Salmon Steelheader University’s website. 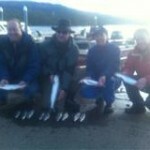 Check it out…, there is a direct link on to the report from this website through our Links section. 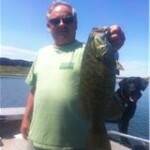 I will be doing my weekly report there from now on and updating here monthly. 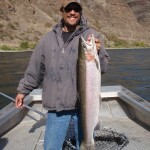 FYI I am also starting to book up the World Famous Snake River Summer Steelhead and King Salmon fishing trips at Heller’s Bar, WA. 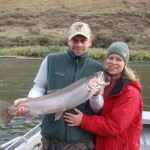 My first date will be October 1st through the First week in November, 2011. 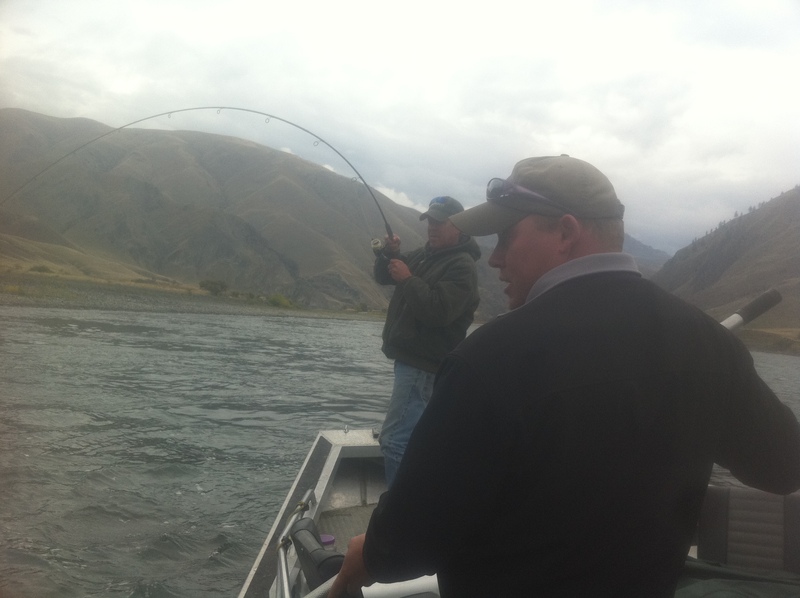 These trips have a FishON Guarantee and in all reality you can look forward to double digit Steelhead and King Salmon days! 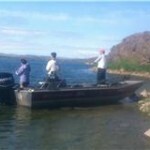 White sand beaches, wild life galour, sunshine fishing, and a truly end of the road fishery awaits you. 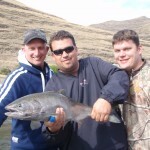 Camp out on the public river or stay in a hotel in Lewiston/Clarkston either way…, this is hands down, my favorite Steelhead,King Salmon, Sturgeon fishery. 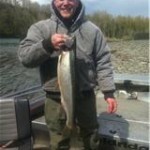 These dates will fill…, if you want to know more and/or have any questions about this absolutely wonderful fishing experience contact me. 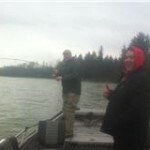 Remember fishing is FUN!! 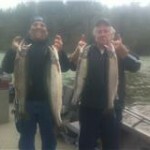 See you all on the water and until next time tight lines and screaming reels to you and yours!!!!! 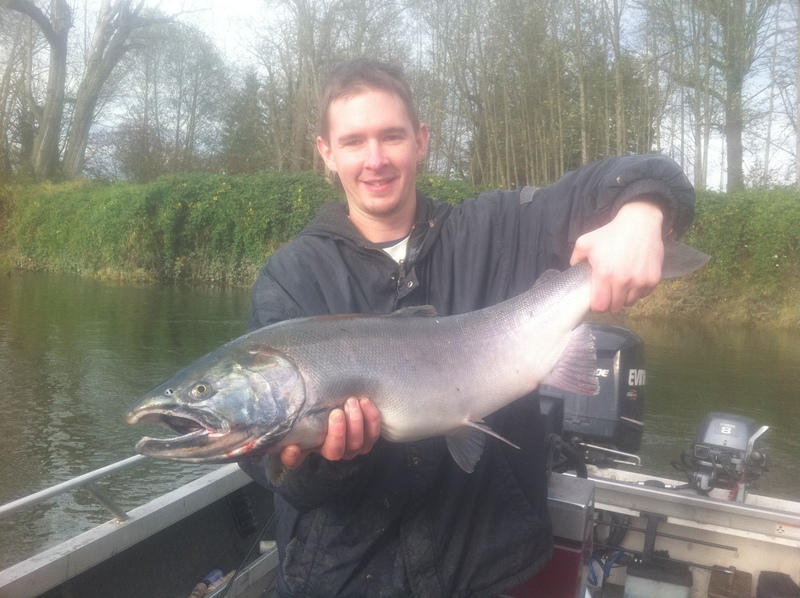 It’s already March and I can’t believe how the time has flown by…, I guess that’s what happens when your having fun catching so many Steelhead :-) The Steelhead fishing was great in February and is continuing on a strong note right into March. 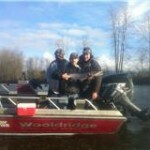 I have been guiding on the Wynoochie and Cowlitz rivers of late…, with good success. 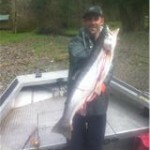 The Wynoochie natives are making a stronger showing every day now and there are still chrome bright, hatchery steelhead to be had, as well! The Chehalis system just rose a bunch and that system will be on FIRE starting today and should remain strong until it closes at the end of this Month. 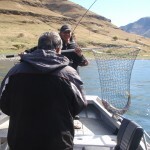 If you want a nice, peaceful, drift boat, trip down The Wynoochie…, the time is now, as the water levels are perfect and the fish are in the river system!! 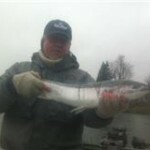 I have also been down on the Cowlitz catching quite a few fish for being, so early in the late winter run hatchery season. 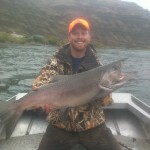 This river will be on fire any day now…., so get yourself a date before it’s too late. 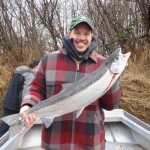 Last year we averaged hooking into limits of steelhead on every trip from Mid March through Mid April…, along with The Springer’s as a very nice bonus catch. 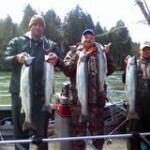 I typically side drift eggs this time of year so we can catch Steelhead and Springer’s side by side Give me a call and let’s get you out on the water and off the couch from watching Hawg Quest and let’s make you your own Hawg Quest episode, with you as the guy catching all the fish on T.V.!! 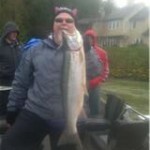 Sorry for the delayed fishing report! 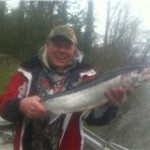 I have been on the water a bunch of late and the time has simply passed right on bye. 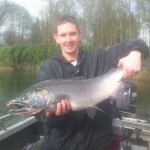 I actually have been blogging on Salmon Steelhead Universities weekly fishing report. From now on…, my weekly updates will be there. 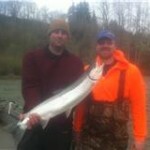 If you go into our “links” there is a direct link to Salmon Steelhead University report. 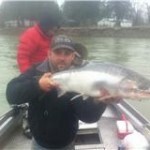 I will continue a monthly overview of what you all missed and what is next up on tap on this website. 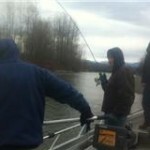 Here we go…, the past month of January had me fishing on the Wynoochie river, as the Skykomish, Snoqualmie and Cowlitz were all blown out. 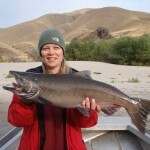 We had some stellar days on the Wynoochie so far this season, with our smallest hatchery fish weighing in at 12lbs and the largest native …., SO FAR at 21lbs!! 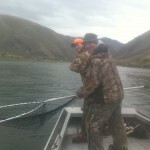 We have been and continue to hook into multiple fish per day. 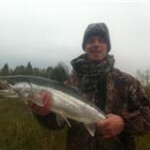 I jet sled and drift boat fish this little gem of a river. 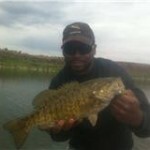 The fishing will remain strong here through March. 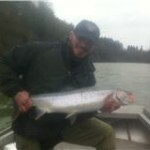 I typically cover 15 river miles a day on this pristine fishery and the scenery is simply fabulous. 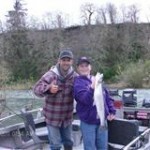 I am now starting to switch gears again…, I will be back on the Cowlitz and starting to fish on the Satsop…, as well as the Wynoochie. 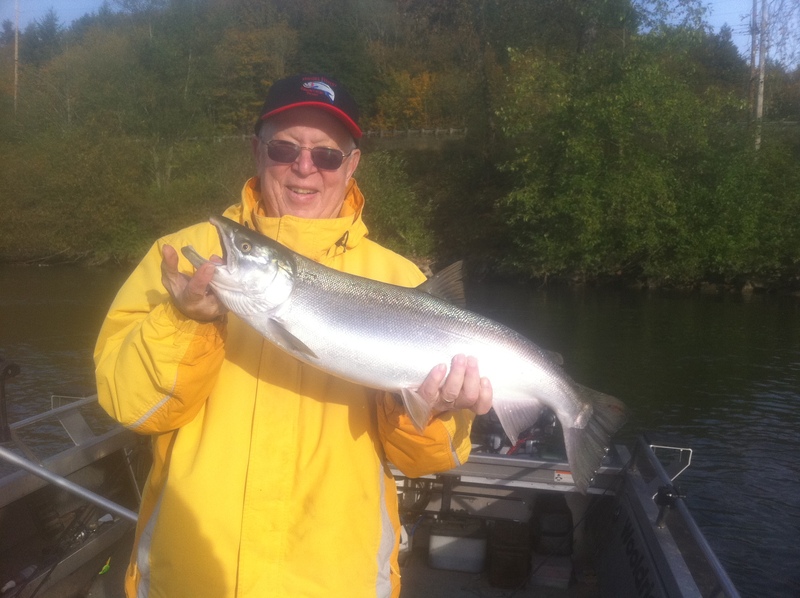 From now through March on these rivers…, mother nature depending of course, we are in line for some spectacular winter run steelhead fishing in our WA State coastal rivers!! 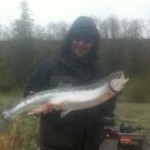 Big natives and loads of late run hatchery fish are what we will be in for. 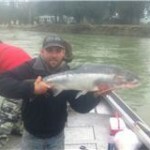 Give me a call, or shoot me an email and lets get you a date to go catch some Huge Natives and/or Hatchery Steelhead for the barbeque. 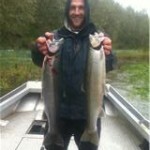 Before this rain storm the fishing has been great and the catching has been above par to say the least. 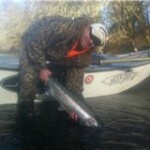 We have already limited the boat on multiple outings this Winter Run Steelhead season. 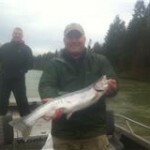 I have been fishing on the Cowlitz, Snohomish and Chehalis river systems, so far this season. 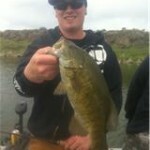 Side drifting good bait has been my key to success lately. 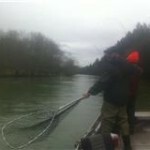 Just keep on moving and searching for a pod of Steelhead and then stick on them and pound that section of river. 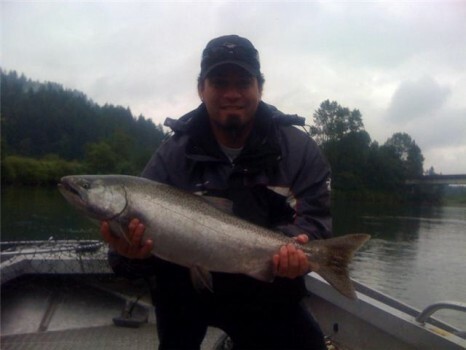 Lets get you out on the water before you miss out on your 2010 chance at chrome, bright, ocean run Winter Steelhead…, quit wishing and lets go fishing!!!! See you on the water. 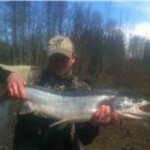 I have been over on the eastside hammering away on the Summer Run Steelhead and sneaky back home to see the Family and guide the Local Coho. 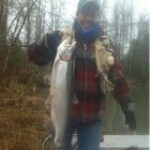 The fishing is going strong over on the Eastside for Steelhead if anyone is interested in catching multiple fish a day, if you want to go I would recommend fishing a date between now and Thanks Giving. 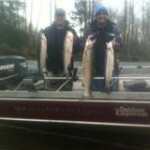 We have been sidedrifting bait to catch these feisty fish and now that the water temp. 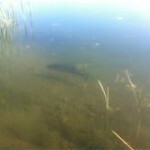 is cooling plugs, along with divers and bait also work well. 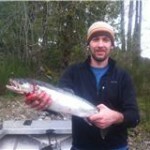 The local Coho have migrated up into the tributaries and are definetly on the tail of the run. 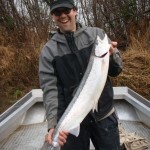 There are some new fish coming in, but the chrome fish are fewer and further apart. 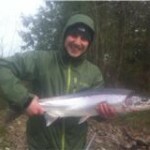 Try fishing eggs under a float in the smaller tributaries and you will catch Coho and you just might catch your first winter run Steelhead of the season, as well! 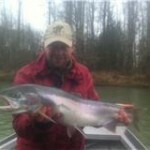 Speaking of Winter Run Steelhead, my winter Western, WA guide season starts up Thanks Giving weekend fishing on the Cowlitz, Skykomish, and Snoqualmie rivers for the month of December. 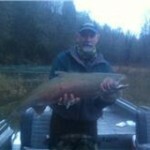 If your looking to catch hatchery steelhead for the BBQ, or Smoker December is prime time! Call me ASAP to get your date of choice for December before it’s, too late. 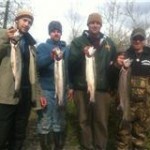 Last year we hooked into limits on almost every trip in December. Ps. 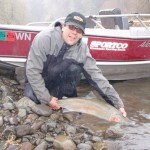 If you bothered to scroll down this far and you book a winter steelhead trip before December 1st, 2010 I will take off 10% of the price of a full day trip. 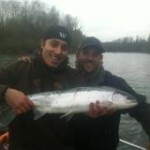 The season runs from December 2010-April 2011. 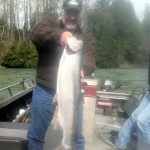 The Summer Time Sun has finally come to WA State and with her heat came the King Salmon retention closure on Sky River. 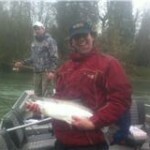 With that stated I am now shifting gears back to focusing on the Sky River SummerRun Steelhead. 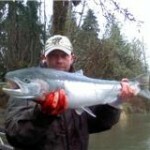 If your looking for a peaceful float down the river, with the opportunity to catch a summer run chromer, look no further than your own backyard. 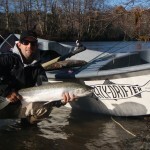 The fish have moved up the system and its time to break out the drift boat. 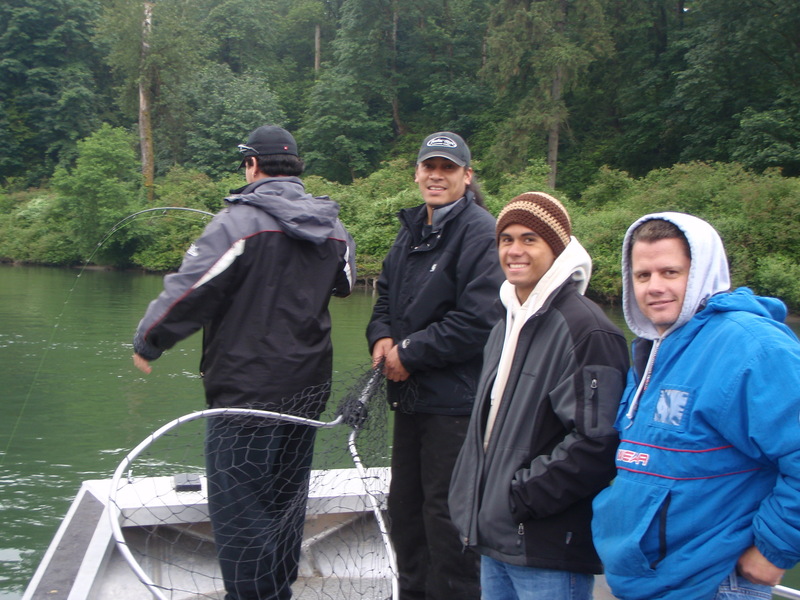 Otherwise, lets get a crew to fill up the jet sled and head down to the Cowlitz River to do battle with Summer Run Steelhead. 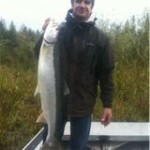 Those fish have definitly shown up and are in the system, as well. Side drifting and pulling plugs are the keys to success down on the Cow. 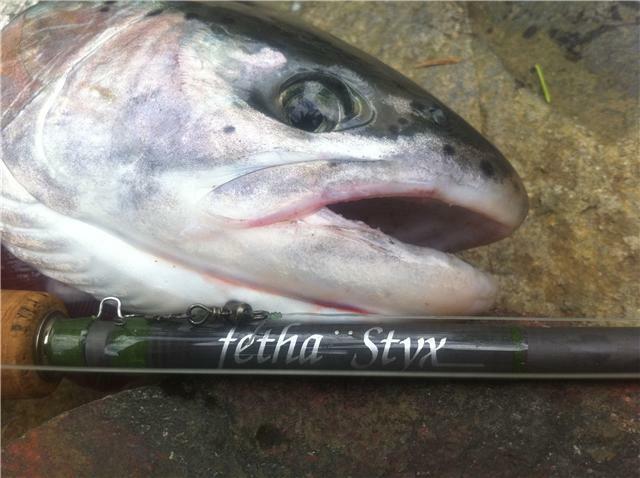 Fetha Styx and North Fork Composities have come together to create what I would consider the #1 new rod on the market today for action and sensitivety. Coming soon to a dealer near you! Contact Billy or Gina at Fetha Styx for more information. 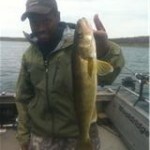 Ps The walleye bite is on over east if your looking for a change of pace.